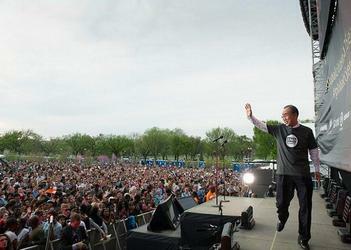 WASHINGTON, DC, April 20, 2015 (ENS) – The Global Poverty Project and Earth Day Network hosted Global Citizen 2015 Earth Day on the National Mall on Saturday. Heads of state, members of Congress, dignitaries, and celebrities from around the world spoke in honor of the planet and the urgent need to protect our only home. Onstage, No Doubt, Usher, using a crutch after foot surgery, Fall Out Boy, Mary J. Blige, Train and My Morning Jacket performed for the crowd of thousands who jammed the National Mall. Speakers included UN Secretary-General Ban Ki-moon, World Bank Group President Jim Yong Kim, Secretary of the Interior Sally Jewell and Secretary of Energy Ernest Moniz. Special guest hosts included: will.i.am and Soledad O’Brien, Coldplay frontman Chris Martin, as well as Don Cheadle, UN Environment Programme Goodwill Ambassadors Erin Heatherton, Freida Pinto, IshaSesay, Tamzin Merchant, Jordan and Eve Hewson, Bonnie Wright, Raphael Sbarge, Julie Gichuru, and YouTube starsMatthew Santoro and Yousef Erakat. 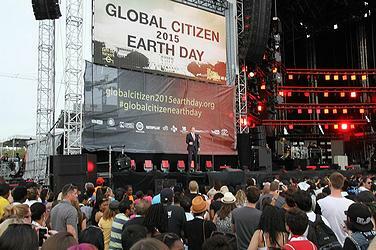 The partners for Global Citizen 2015 Earth Day include: Caterpillar Inc., Citi, CJ Corporation, Toyota, iHeartMedia, Clear Channel Outdoor, MSNBC, YouTube, Google, Alcantara, and Connect4Climate. Content presented in partnership with the World Bank Group. With over one billion actions to date, Earth Day Network’s A Billion Acts of Green, the world’s largest environmental service campaign, is building commitments by individuals, organizations, businesses and governments to protect the planet. A Billion Acts of Green inspires and rewards simple individual acts and larger organizational initiatives that reduce carbon emissions and support sustainability. Earth Day Network launched the campaign in 2010, Earth Day’s 40th anniversary, with the goal of registering one billion actions in advance of the United Nations Conference on Sustainable Development (Rio+20) in June 2012. One billion actions were registered on Earth Day, April 22, 2012. Now, the goal is to reach the next billion actions. People can still register the actions they’re taking to protect the environment, from washing laundry in cold water and riding a bike instead of driving to planting a garden and volunteering with a community clean-up. Organizations can register actions such as community environmental meetings, tree plantings, large-scale light bulb changes, workplace renewable energy retrofits, and Earth Day events. One of the most noteable actions came from Crayon Collection, which took up gently used crayons for donation to high poverty elementary schools. Volunteers around the globe make this initiative possible. Another came from the organization Together to Protect Humans and the Environment Association, which distributed Earth Day Network’s environmental lesson plans to 900,000 students in the Kurdistan region of Iraq. On Earth Day, these students made many individual commitments to A Billion Acts of Green. Green Light New Orleans committed to install over 300,000 energy efficient light bulbs across New Orleans in coordination with A Billion Acts of Green, representing one bulb for each city resident. And in Kuwait a group inspired by A Billion Acts of Green organized a national campaign that registered over seven million Acts of Green in 2011. The campaign worked with students, communities, and local governments on commitments to reduce energy consumption, conserve water, increase recycling, utilize public transportation, organize environmental education events, and more.